One thing I particularly like about my new job -beside the fact that I speak English every day, have great workmates and enjoy the work itself- is that I can bring my lunch in and most people enjoy seeing my sometimes eccentric foodstuff. Last time I brought onigiri in they were really popular, probably because of my cute box and the fake grass they were sitting on. They are eaten at room temp or cold depending on the filling since you can't leave tuna and mayo for too long out of the fridge while pickled apricots have strong antibacterial properties so you could leave them all day and they wouldn't be bad for you. The following recipe is adapted from Everyday Harumi, by Harumi Kurihara , a book I like a lot for its superb photography and the delicious recipes I have made from it already : 12, not a bad record by any means. Wash the rice in cold water a few times and leave in a strainer for 10-15 minutes before cooking. Put it in a saucepan with 415 ml water, cover, and bring to a boil. Then reduce the heat to low and cook for 10-12 minutes. DO NOT take the lid off! Turn off the heat and leave with the lid on for 10 more minutes. Put all your remaining ingredients in a saucepan and mix together. Bring to a boil and cook until almost all the liquid has been absorbed. It takes about 10 minutes. Mix the rice and the ground chicken together and let it all cool down to warm before shaping into small rice balls by hand or with a special mould. Remember to keep your hands and equipment nice and wet while shaping. I managed to shape three big triangles but the rest started to collapse, for which I blame the residual soy sauce in the chicken. It might be a good idea to drain it or let it evaporate completely in the pan. 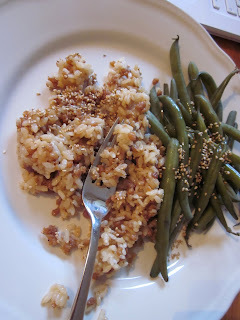 It's not bad because I had some of the remaining mixed rice with some green beans dressed with a little sesame oil and sesame seeds and it was delicious. It all looks very interesting, Julie. Am learning a lot from reading your blog. Thanks for the English post Julie - my GCSE French isn't up to too much translation! Your lunch looks gorgeous, I'm so impressed.